Home All News What Is the Memory Center’s Town Center Concept? Imagine a small town center, one where everyone knows each other, where people smile, stop and chat for a while and where anyone who needs assistance is offered it by store personnel, food servers or passersby. This is the type of town we wish existed for everyone with dementia – a place where individuals have as much autonomy as he or she wishes, but where families never have to worry about their loved one getting lost, being scared without comfort or not having the type of care he or she needs on a daily basis. Well, guess what? That town center concept actually does exist – and there are currently people with dementia enjoying day-to-day life, going where they want when they want – with their every need and attention to well-being taken care of. 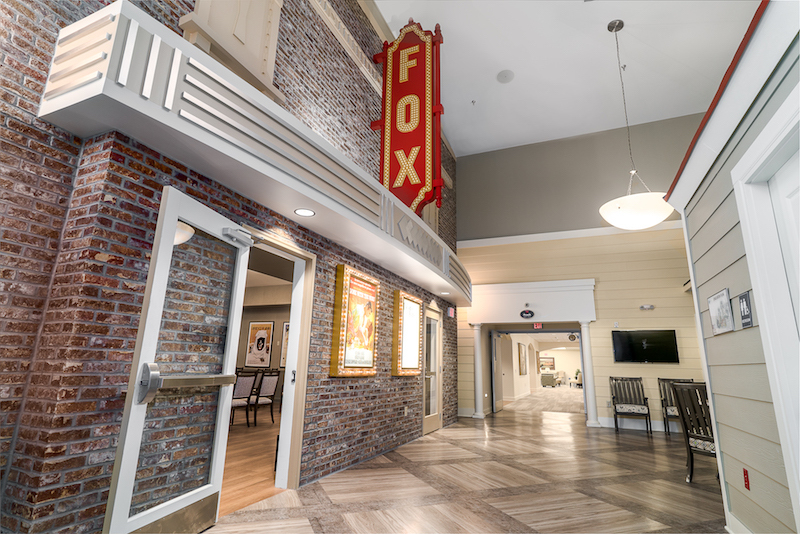 Our Town Center concept is a favorite feature in our Memory Center communities , and we are the first memory care providers in the United States implementing this innovative and highly-successful concept. Residents and family members alike love our town center design because it gives our communities a less institutional feeling and helps residents to feel more at home. Our innovative town center, which can be found at all Memory Center locations, allows our residents and their loved ones to enjoy a reality that provides freedom, independence and natural social rhythms that lead to a higher quality of life. Are Other Organizations Using a Town Center Concept? Back in 2009, Yvonne von Amerongen and others founded Hogewey a village in the Netherlands that is wholly devoted to those with dementia. Founded as a neighborhood where people can get out and about, enjoy the seasons, visit a restaurant, and can come and go as they please. Sounds like any other place – other than the fact that all of Hogewey’s residents have dementia. You can watch a fantastic. How Are the Memory Center Town Centers Structured? 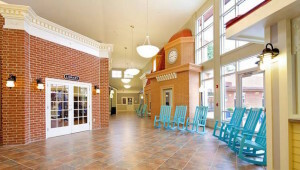 Hogewey exists as a larger neighborhood, the Memory Center’s unique Town Center is more like a small village square within our memory care facility. This feature is appealing to residents who want to visit the library, enjoy the salon, walk into a store, see a movie or people watch in the town center, they can walk out their door and head that way at any time. If they get lost, they’re simply directed by another resident or by one of the ample staff and caregivers who are onsite 24/7. Each of The Memory Center’s “Town Center” design is structured similarly to the downtown areas in the communities where we exist to make them more realistic. The design incorporates local landmarks that residents can enjoy and recognize. It’s difficult to feel “free” or “independent” when forced to spend the entirety of your life in hallways and rooms, and/or within smaller, walled-in patios and grounds. Not only does this create a sense of being “trapped,” science has proven the absence of daylight and the normal, seasonal rhythms wreaks havoc on – a system already compromised for those who have dementia. That’s why the Town Center design is one that is very open, with large windows and ample sunlight. Residents who visit our Town Center know whether it’s morning, afternoon or sunset, whether it’s cloudy or rainy and may even opt to “skip their errands” altogether if the weather is inclement. And, just like in a real town, things shut down at realistic “closing times” so residents are encouraged to be up with the sun, and in bed with the moon – as our bodies were made to do. The Tavern is one of the Town Center “hot spots,” a place where residents gather with friends for happy hour or watch a game on TV. 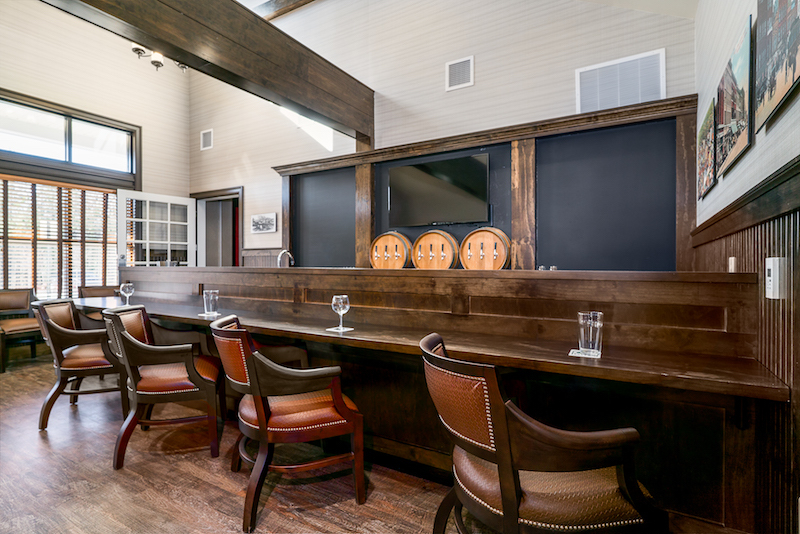 It’s also a favorite place to take family and friends when they have visitors to enjoy a private dining experience. Each communities Tavern does serve alcohol to residents who have a Physician’s order. Often times, a resident who may experience “Sundowning” can benefit from an afternoon cocktail to help relax them possibly eliminating the use for certain medications. Each Tavern also serves a variety of mocktails and non-alcoholic beer and wine for those her are unable to have alcoholic beverages. This allows the resident to enjoy the experience with others – minus a bill at the end! from recent releases to classic, black-and-white favorites. Not surprisingly, going to the movies can also help to pass the time for parents and their children, or grandparents and their grandchildren, particularly when dementia has progressed to a point that makes normal conversations difficult. Can you imagine an existence that doesn’t involve heading the grocery store on a weekly basis? Attending to the store list is part of our day-to-day rhythm, so the ability to shop for groceries and other relevant essentials brings back a sense of normalcy that is often gone forever when transferred to an assisted living or memory care community. Our Activities staff is trained to work with those with dementia and while you wait in line to “check out at the register,” just like you would at any store, no money has to change hands. 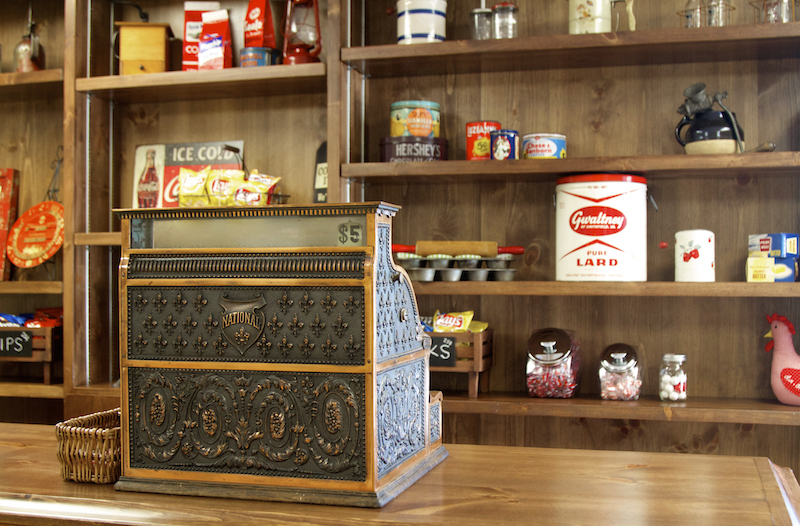 However, if a resident wants to use the money the staff simply uses General Store cash provided by The Memory Center. The Town Center salons ensure everyone can have regular haircuts, hair coloring and/or perms to maintain a perfectly coiffed countenance. Hair salons and barber shops are other things that often end up by the wayside, and are greatly missed by those who had weekly or monthly appointments. The concept has had a notably positive effect on our residents because it gives them a sense of independence they simply can’t enjoy otherwise, and the growing array of amenities available to them mean less reason for families to take them elsewhere during visits – which can exacerbate confusion and agitation when they return. You go to visit your mother or grandmother and are greeted with a polite hello (if she no longer recognizes you) or a welcoming hug (if she does). You visit for a while but her stories are circular and repetitive. To provide some relief you offer to take her to lunch. After signing her out, she gets a bit confused – and this confusion and agitation grow by the minute. By the time you return, she’s visibly upset and may even be in tears – wondering why you’re leaving her there, or inquiring why you didn’t take her “home.” This is unsettling at best, and emotionally devastating at worst. Our Town Center creates an alternative scenario that looks much different. You greet your loved one and the two of you simply head to the Town Center to enjoy lunch, a coffee, the daily ice-cream social that is filled with families and staff or any of the many daily activities. Afterward, you stroll to another common area – or return to their room when it’s time to leave – no confusion, no agitation and all the benefits of “an outing.” Not only has your loved one had a pleasant visit with you, you are able to enjoy the time with your loved one and know that at anytime a staff member or Nurse is available if needed. This is one of the many reasons why at The Memory Center communities we are Living Well with Alzheimer’s and other Dementias.